Students will grow in their reading ability, tackling full-length novels, and expanding their vocabulary and comprehension. Students will practice the art of narration in retelling and summarizing stories. Note to parents: It would be good for your child to read aloud to you or to someone else for the reading assignments until your child is feeling fluent and competent reading novels. You could even take turns reading sentences, then paragraphs, then pages to help him or her get used to reading larger books. Write the title and author of the book in your reading notebook. What does the Roman Numeral for number 1 look like? If you can’t remember, look at the number at the beginning of chapter 1. Tell what happened in the story to a parent or older sibling. What does the Roman Numeral for number 2 look like? Another important reminder as you are beginning the year. If you you click on a link and the link is not working please do not just skip it or find something similar to use, let your parent know so that we can get this fixed right away for you and for other users. What does the Roman Numeral for number 4 look like? Tell what happened in the chapter to a parent or older sibling. Another way to help your child talk about the chapter is to ask about the title of the chapter and what it means. Tell what happened in the chapter to a parent or older sibling. What does the Roman Numeral for number 6 look like? What does the Roman Numeral for number 7 look like? What does the Roman Numeral for number 8 look like? What does the Roman Numeral for number 10 look like? What does the Roman Numeral for number 11 look like? What does the Roman Numeral for number 12 look like? What does the Roman Numeral for number 13 look like? What does the Roman Numeral for number 14 look like? What does the Roman Numeral for number 15 look like? What does the Roman Numeral for number 16 look like? What does the Roman Numeral for number 17 look like? What does the Roman Numeral for number 18 look like? What does the Roman Numeral for number 19 look like? What does the Roman Numeral for number 20 look like? Here’s a picture of a “four-armed” woman carrying milk pails. What does the Roman Numeral for number 21 look like? Congratulations! You read a whole, big book! 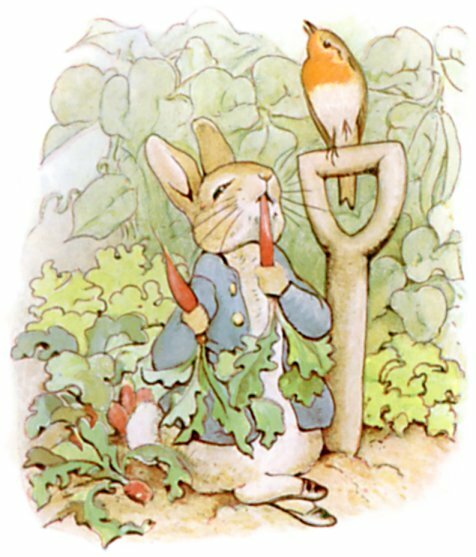 Read The Tale Of Peter Rabbit. Or you can listen and read along with the video. What happens in the story after this picture? Just say the answer out loud if you don’t have anyone with you to tell. What is happening in this picture? Then what happened? Read half of The Tale Of Jemima Puddle-Duck Part 1. Tomorrow you’ll finish reading it. 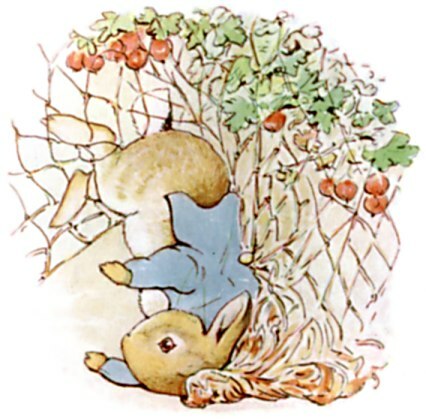 Read the last part of The Tale Of Jemima Puddle-Duck Part 2. Tell someone about the story. Who was “helping” her? What did he really want? Today for reading you are going to watch a movie! Watch The Tale of Squirrel Nutkin. Today you are going to read the beginning of The Tale of Squirrel Nutkin Part 1. Squirrel Nutkin is impertinent. By the way he acts toward the owl, whom everyone else shows respect, what do you think that word means? Today you are going to read from The Tale of Squirrel Nutkin Part 2. Impertinent is the opposite of respectful. Do you think anything is going to happen to Nutkin because of his impertinence? Today you are going to finish reading The Tale of Squirrel Nutkin Part 3. What happened to Nutkin because he was impertinent? Tell someone about the story. Who is the story about? Tell someone about what happened. Why is Mr. Frog uneasy, uncomfortable around Solomon? Tell about the story of Solomon Owl so far to someone in your family. Do you know what it means to “inquire?” Instead of the sentence being, “What have you been eating?” she said, it uses the word inquire, not said. So we can figure out that it tells us about how she said it. If the sentence had used an exclamation point, then maybe the sentence would have been, “What have you been eating!” she shouted. What clues do we have about the word inquire. It tells us how she is saying those words, and we see a question mark. The question mark tells us that she is asking a question. So, inquire must mean something about asking a question. In fact it does. To inquire means to ask. Use your clues and your detective skills to figure out words you don’t know. What do you think happened to Jasper Jay? Tell someone about what happened in the chapter. Read the first paragraph of Chapter 17 of The Tale of Solomon Owl. What do you think Solomon and his cousin are going to do together? Why? When it talks about “39 winks,” that is a joke. To “catch 40 winks” means to take a nap. So, if he only got 39 winks, he didn’t get all his sleep. He’s tired because he can’t sleep because he’s thinking and worrying. Read the first paragraph of Chapter 19 of The Tale of Solomon Owl. Does Solomon want it to get warmer? How do you know? Draw a map of the book’s setting as best as you can. The setting is where it takes place. Listen to the story of Little Red Riding Hood. Choose one of these books to listen to: Sophie’s Masterpiece, Stellaluna, Harry the Dirty Dog, The Rainbow Fish, The Tooth, Guji Guji, Romeow and Drooliet, A Bad Case of Stripes. Say or write the pairs of rhyming words in the poem in lesson 4. Tell someone what the stories were about. Read lessons-10 and 11 (X and XI) in the McGuffey Second Reader. What is the lesson of lesson 10? What did the bird say in lesson 11? Read lessons-12 and 13 (XII and XIII) in the McGuffey Second Reader. What is the lesson of lesson 12? If you were a sunbeam, what would you do? Write or tell your answer. Read lessons 17 and 18 (XVII and XVIII) in the McGuffey Second Reader. What is the boy good for? What are some things you learned about the King bird? What steps are taken to shear sheep? Read lessons-26 and 27 (XXVI and XXVII). How did Patty tame the squirrel? Read lessons 32 and 33 (XXXII and XXXIII). What are two things you learned about tigers? Read lessons-35 and 36 (XXXV and XXXVI). Retell the story to someone. Read lessons 37 and 38 (XXXVII and XXXVIII). How did the boy build the scale? Tell someone something you learned about the fishhawk. What did the leaf say? Read some knock knock jokes! Read a story about Garfield in the Park. Click on the long button toward the top to choose the story. Answer the questions out loud. Read a story. Choose Garfield and the Beanstalk. Click on the long button toward the top to choose the story. Answer the questions out loud. Read Luke on the Loose. Read Benny and Penny. Penny forgives Benny, but Benny needs to guard his tongue. He could have really hurt Penny with his words. Begin reading The Tale of Reddy Woodpecker. Read Chapter 1 . Here is the audio if you’d like to have it read to you. Before we start reading our next book, we’re going to play some reading games. This one will help you remember some of your phonics rules about the sounds different letter combinations make. This game will help you think about words as families. When you can read one word in the family, you can read them all. When you come across a word you don’t know, look for familiar pieces of the word. Follow the directions in the activity to create words in the same family (which means you are going to find rhyming words). Read along about New York. To get to your book you will need to go to the Tumblesearch (top left of the screen) and choose to search by title. Type in New York and look for Postcards from New York City. Read along about Chicago. To get to your book you will need to go to the Tumblesearch (top left of the screen) and choose to search by title. Type in Chicago and look for Postcards from Chicago. Read Chapter 1 of The Adventures of Danny Meadow Mouse. This book is by a different author. Here is the audio if you’d like to follow along. Play a synonym game. A synonym is a word that has a similar meaning. Tell someone what happened in the whole book! *Fill in the book report form. Print out one page either b/w or color. We’re going to do some reading games this week. Shoot the synonyms, word of similar meaning. Play the game and find the synonyms and antonyms, words of opposite meaning. Play the game and choose the correct spelling of the words. Choose the correct description such as good, better, or best! These are all homophones, words that sound like other words but have a different spelling than them. Read chapter 1 of Buster Bear by Thornton Burgess. This is a different series of animal books. I think you’ll find them funny. Read chapter 2 of Buster Bear by Thornton Burgess. Read chapter 3 of Buster Bear by Thornton Burgess. Read chapter 4 of Buster Bear by Thornton Burgess. Read chapter 5 of Buster Bear by Thornton Burgess. Read chapter 6 of Buster Bear by Thornton Burgess. Read chapter 7 of Buster Bear by Thornton Burgess. Read chapter 8 of Buster Bear by Thornton Burgess. Read chapter 9 of Buster Bear by Thornton Burgess. Read chapter 10 of Buster Bear by Thornton Burgess. Read chapter 11 of Buster Bear by Thornton Burgess. Read chapter 12 of Buster Bear by Thornton Burgess. Find the opposites. Words that mean the opposite are called antonyms. Read chapter 13 of Buster Bear by Thornton Burgess. Read chapter 14 of Buster Bear by Thornton Burgess. Read chapter 15 of Buster Bear by Thornton Burgess. Read chapter 16 of Buster Bear by Thornton Burgess. Read chapter 17 of Buster Bear by Thornton Burgess. Read chapter 18 of Buster Bear by Thornton Burgess. Read chapter 19 of Buster Bear by Thornton Burgess. Read chapter 20 of Buster Bear by Thornton Burgess. Read chapter 21 of Buster Bear by Thornton Burgess. Read chapter 22 of Buster Bear by Thornton Burgess. Read chapter 23 of Buster Bear by Thornton Burgess. Tell someone the story of the whole book. How would you describe Buster Bear? Write a list of words that tell about him. What does he look like? What does he act like? Is he funny? Is he grumpy? *Fill out a book report form for Buster Bear. Choose a story to read and to listen to. Read the second and last poem in this packet. Read them out loud. Read the third and the last poem in this packet. Read them out loud. Read the poems called “Days of the Week” and “Monday, Mommy Baked a Cake” as well as the last poem in this packet. Read them out loud. Read the poems called “The Months” and “The Year” as well as the last poem in this packet. Read them out loud. Read the poem called “The Goops” as well as the last poem in this packet. Read them out loud. Read the poem called “The Bird” as well as the last poem in this packet. Read them out loud. Each day read the chapter or chapter portion. This book is just for fun. It’s called, Answering the Call: The Roma of Macedonia. It is based on real people and places and events in Macedonia. Read Chapter 1 of Answering the Call. Read Chapter 2 of Answering the Call. Read Chapter 3 of Answering the Call. Read Chapter 4 of Answering the Call. Read Chapter 5 of Answering the Call. Read Chapter 6 of Answering the Call. Read Chapter 7 of Answering the Call. Read Chapter 8 of Answering the Call. Read chapter 9 of Answering the Call. What did you learn about Macedonia? the Roma? missionaries?